We have been looking at the toll bridges along San Francisco Bay. On the west side of the Benicia Martinez Railway Bridge is this 1.2 mile long truss bridge that was built in 1962. 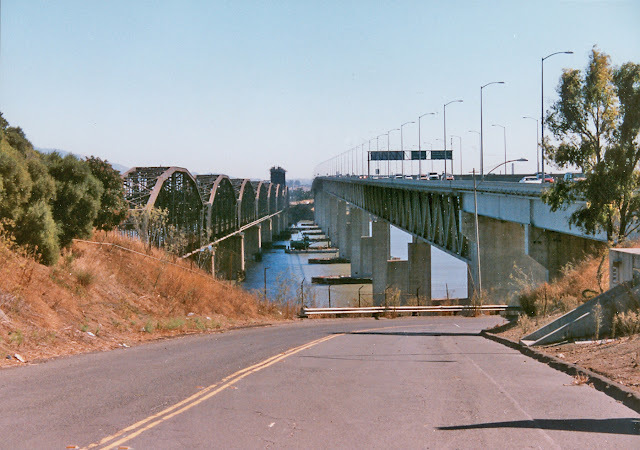 I am very familiar with this bridge because of the giant friction pendulum bearings that we used for it's seismic retrofit and also because I used to drive over it a lot when my son was going to UC Santa Cruz. We'll take a look at the bearings tomorrow. Part of the pleasure of driving over this bridge is seeing the old mothballed ships from WWll sitting to the east in Suisin Bay. There's a Sam Peckipah movie, "The Killer Elite" where the big fight scene at the end of the movie takes place on these ships. I'll see if I can find a photo of the fleet. I'll also see if I can find a better photo of the railroad bridge which is much older (build in 1930). I believe there is a lift span at the center of the bridge which may be permanently closed. I know the bridge is still used because the Amtrak trains take it a dozen times a day between Sacramento and San Francisco (actually to Emeryville and then a bus ride into San Francisco). My photo has a reddish tint perhaps because it was originally on film and scanned at a later date. It's tough to find a good place to photograph these bridges. The Sacramento River eventually goes into Carquinez Straits, but there are so many islands and tributaries that I would get lost trying to paddle to it in my kayak. California's Bridges: Benicia-Martinez Bridges across the Carquinez Straits (2) by Mark Yashinsky is licensed under a Creative Commons Attribution-NonCommercial-NoDerivs 3.0 Unported License.